Today, I want to share my secret strategy known as retail to recruit in MLM. This is a strategy that isn’t taught in most network marketing companies, but should be. It’s a very effective way to make more money in your network marketing business. 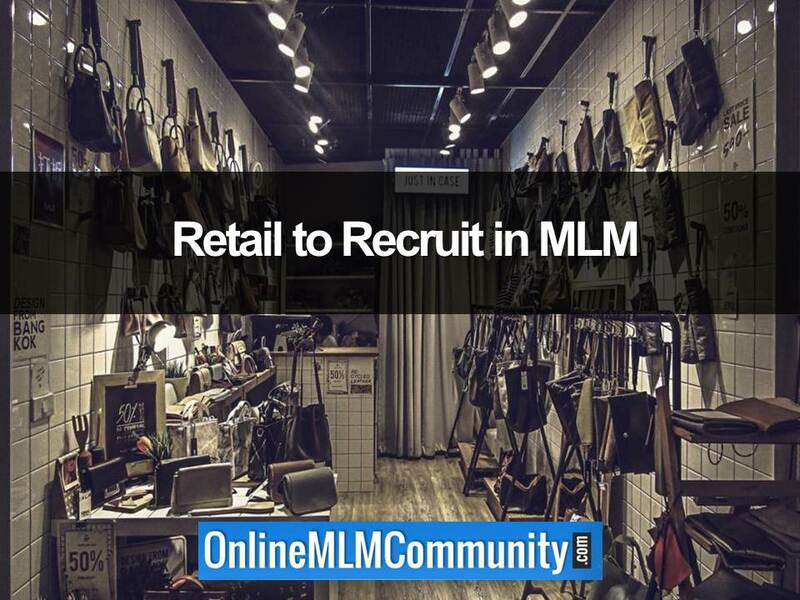 What is the Retail to Recruit in MLM Strategy? The Retail to Recruit in MLM Strategy is the process of leading with the products, rather than focusing on just recruiting new distributors. It’s the process of making sales, finding new customers and being product focused. You lead with the products, find a customer and then upgrade a percentage of your happy customers into part-time distributors and business builders. Before I get too deep in my Retail to Recruit in MLM Strategy, it’s vitally important that I explain the difference between MLM and direct sales. Even though these two terms are interchanged a lot, they are totally different. Direct sales is just about selling a product. Think of the Avon lady for a minute. All she does is focus on selling products to her current customer base and finding new customers. Network marketing, on the other hand, is about a lot of people doing a little bit to build the business. Hundreds, even thousands, of team members all use the products, service a customer or two, and refer others to the business opportunity. If you’re trying to succeed in network marketing, you do need to have an emphasis on recruiting; however, you should ALSO be retailing the products. It’s a healthy balance of the two activities. Here are a few reasons you should consider leading with your products and being product focused, rather than just trying to recruit new distributors. # 1 Everyone likes to buy stuff, but most people are not entrepreneurial and do not like selling. If you talk to 100 people, all 100 people buy stuff. However, maybe only five or ten out of those 100 people are entrepreneurial or like sales. This means that if you only focus on the business opportunity side of things, 90 percent of the people you talk to will not be interested. # 2 If no one buys anything, you don’t make money. You can recruit as many people as you’d like, but if no one is buying or selling the products, you won’t make a penny. We get paid to create volume. Retailing is the fastest way to create volume. # 3 Happy customers make happy distributors. People who love your company’s products or services will be your best business builders. Why? Because they love the products or services and they can’t help but sharing them with others. It’s easy to sell or share something you are passionate about. # 4 Customer stick around longer. People who join the business just to make money normally drop out in 30 to 90 days, whereas people who buy the products because they want to, typically have a higher retention rate. I don’t place a HUGE emphasis on retailing, but I do teach my team members to maintain two to five personal retail customers at all times. This helps cover the cost of their own order and might even provide some additional profit. Plus, if you don’t service any customers yourself, it’s hard to teach other people how to do it. I’ve found that two to five customers is enough. Once you have that, and maintain it every month, focus on recruiting. On the other hand, I do have some team members who are 100% retailing focused. There’s teams don’t grow as fast as people who are more recruiting focused, but they do make a nice check. Food for thought. If you really want to master the Retail to Recruit in MLM Strategy, here are a few tips for success. You wouldn’t want to own a Ford dealership and drive a Chevy. You should be your own best customer and use all of your company’s products. This will help build up your belief and knowledge about each product. Stories sell. Develop a good product story for each product your company offers. If you don’t have a good product story of your own, get one from a happy customer that you can use. Your prospects will only believe you so much, but they will believe what others have to say. Create a portfolio of testimonials from happy customers. Make sure they are compliant and approved by corporate. Share printed out testimonials with your clients. Do not be stingy with samples. Use samples with your prospects. If your product is good, the sample will do most of the selling for you. Stay in touch with everyone you talk to. Build up your list or address book of names. Communicate with every customer and prospect minimum once per month. The fortune is in the follow-up. Ask for referrals whenever you can. Explain to your customers how they could earn money by referring others. If that interests them, explain how the business works and sign them up as a distributor. After your customer has ordered several months in a row, show them how they can sign up as a distributor and buy their products at wholesale. Most people like to save money, so if they really like the products, they will strongly consider doing this. Study selling. It is an art form. Read books, talk with your mentor, attend events, and watch helpful training videos about selling. Improving your sales skills will pay you big dividends in your business. 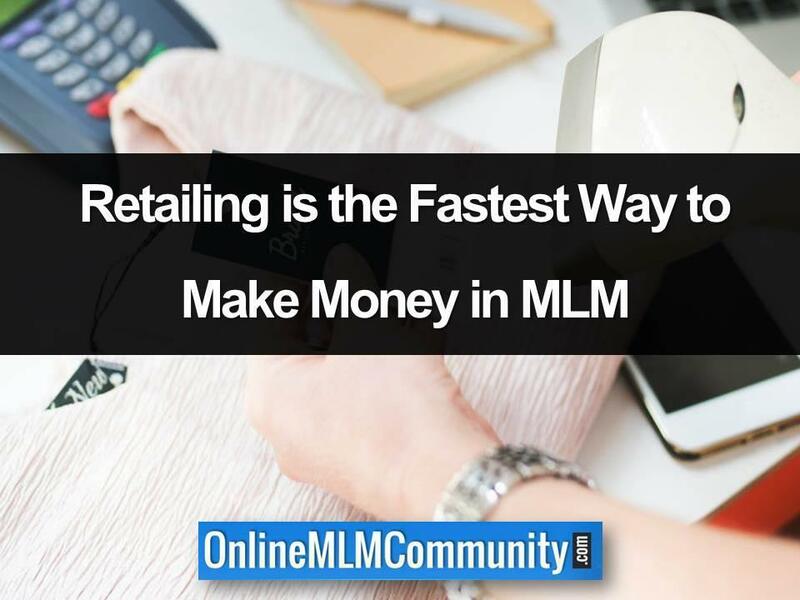 The fastest way to make money in your MLM Business is by retailing. You will make more money by having 20 loyal customers than you would by having a team of 100 people. When you factor in the retail profits and commissions, it’s much easier to make larger commission checks right out the gate, just by retailing. Of course, the BIG money in MLM comes from building a team, but it can take several YEARS to build a big team. Establishing a large customer base first is much faster and much easier. There you have it folks. This is my Retail to Recruit in MLM Strategy. I hope you found the information helpful. What are your thoughts on this subject? Leave a comment below to let me know what you think. I look forward to hearing from you. Next Next post: How Many MLM Prospects Should You Approach Every Day? It is very true that people are much more receptive to learning about products than they are to learning about a business opportunity. If people can see the value in what you are selling and they become a believer in the product you have to offer that can easily transform into a person wanting to become a part of the team. It is easier to get someone to make that transition than to get someone to join a business they know nothing about selling products they know nothing about. I agree. If people are passionate about the product line, there is a good chance they will become a loyal distributor as well. I agree with this approach. It is far easier to sell products than the opportunity to sell them. It is a smaller commitment for your customers, and less intimidating a proposition. If they love the products, it will be easy to continue to sell them the products, and sooner or later, they will ask you about the opportunity. I liked that you pointed out the income stream is larger when you are selling the products yourself. I believe that some MLM business owners tend to forget that, and pour all of their efforts into recruiting people to work under them, and forgetting to follow up with and nurture those relationships with their existing customers. Yes, it is much easier to sell a product or service than it is to go out and find someone else who wants to sell it. I would also say that at this point in time, I would be somewhat skeptical if a MLM uses the other approach. A network marketing company will not survive if they are not selling the products. In my opinion, selling products or services should be the #1 priority before getting new distributors. As pointed out, when many customers see the savings they can gain by being a distributor, you will build a down line with them. Hopefully many MLMs will read this and learn this valuable lesson. I agree that getting customers first is the best way to go. It makes me so very happy to hear some MLMs are going to this principal of doing business. In all actuality, in is plain common sense. By selling the product, it keeps the business flowing. When people use the products and like them, you can then show them how they can save on the products by becoming a distributor. It just all works like a clock if done the way you stated…retail to recruit. I hope other MLMs consider this approach. I believe it will help the reputation of MLMs completely by doing so. Retailing to recruit is the only way to go as I see it.